The keen herding instinct and great power over sheep that working collies possessed were such useful assets that it was worth trying to find a milder-natured type to cross with them. A Northumbrian farmer, Adam Telfer, succeeded in finding the right blend of types in 1894. The Border Collie of today is descended from Telfer's dog, "Hemp". Not only various temperaments, but a variety of working styles and skills, were combined in Hemp to produce the Border Collie. The name "Border Collie" was coined after World War I to distinguish working collies from show collies. Bred for hill conditions, the Border Collie is outstanding when it comes to working sheep. Able to perform a variety of tasks, he is born with instinct to "gather" the sheep to the shepherd, a trait that makes him most useful on the hill. A Border Collie's ability to control sheep is measured by the "eye" (the amount of concentration on sheep that the dog shows). Because they must often work far from their handlers, Border Collies must be intelligent and independent. This breed has not earned the name of perhaps the most intelligent dog for no reason! They are extremely clever, can easily figure out how to open a door and when it comes to training, they are an absolute joy. The ideal home for this wonderful breed is one where it will receive the excessive exercise it craves, where it will be part of the family and receive the mental stimulation they require. A garden is a must for this breed, but bear in mind that they are excellent jumpers so a high wall is required, and if they make up their mind to go an investigate on the other side of the wall, can easily find way out of it, which they are likely to do if they are bored and left alone too often. They do not do well being inactive so keep them occupied with plenty of toys such as Kong’s and chew toys and ensure they get both the mental and physical stimulation they need, and are especially active when young. As they are a herding breed, they are prone to herd just about everything and this can include your children, and other animals and moving objects such as bikes and cars! It may sound that I am trying to put you off getting one – i am not – BUT, you must be the right owner for this dog – if you are prepared to put in the times, supply both physical and mental stimulation, you will end up with the most affecionate and devoted dog, if not, you may end up taking your Border Collie to a rescue centre – which is why so many end up there – wrong owners - nothing wrong with the breed! Border Collie’s in the wrong environment and with the wrong owner can be exceedingly destructive as if you do not supply what this dog needs, it will entertain itself – often assisting to demolish anything around it. They can be prone to be sound sensitive, so early desensitizing to noise and storms is required (get your pup during the rainy/storm period if possible). They are also prone to obsessive tendancies, especially if they do not receive the menatal and physical stimulation they need. Some of them do appear to be vocal, in that they will ‘talk’ to you and let you know when they want to go outside, want to be fed etc, and at times it can appear as if they are ‘backchatting’ you. They are not dogs that should be left alone for long periods of time – they prefer to be with and around their people. Always from a reputable and responsible breeder. Have a look at the KUSA website and also KUSA affiliated breed clubs. Also have a look at our Puppy Page where you will find article on both breeders and what to look for in a puppy. These dogs can be excellent with children and other dogs, but their herding instincts are at the fore in general. This means that they will try to herd both children and other dogs and can on occasion nip at the ankles as it would do with sheep. Your first step with your pup is to train it not to engage in herding with children. They can get on well with other dogs, but do try and match the size and age for maximum compatibility as they love to run and play. 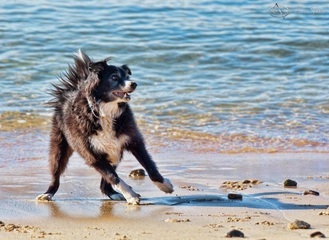 Very often Border Collie owners will have two of the same breed, just for this reason. They can get on will with cats, especially if brought into the home when the dog is a pup. However, they can tend to chase and try and herd them as well no matter how well known the cat is. A problem that this breed often has with other dogs that are not known to it, is the manner in which they ‘clap eye’ and will stare at another dog, often going into a crouching position while approach - which is a behaviour they engage in while herding. Other dogs can interpret this as a sign of reactive behaviour. Being extremely clever dogs they are easy to train and love learning new things. They do well with clicker, Agility, Dancing, Herding, Flyball and virtually all dog related sports. These dogs were born to work and the more you do with them in this aspect, the happier the dog will be. Border collies come in two types of coats: the smooth coat or short hair variety, and rough or long hair. Generally, the rough coat varieties will lose their coat at least once a year. This is called "shedding out" or "blowing coat" and during that time, the hair can come out in thick clumps. The hair that is shed is dead hair and is usually off colour. This can be groomed or brushed out regularly. However the majority of this breed will shed a little bit all year round. Regular grooming needed to prevent hair tangling and matting. They've been called the most intelligent breed in the world. So prospective owners should ask themselves, "Do I want a dog who's smarter than me?" But for the right person, the devoted, passionate Border Collie parent, the breed makes an affectionate and extraordinarily devoted pet. Take the time them and give them plenty of opportunity to participate in dog related sports. Stimulate this dog mentally with activites such as Clicker, tricks etc – they thrive on this. Take on this breed if you have a very busy life and don't have time to train and exercise and give them the time they need. Also, like Hip Dysplasia, there is another disease that affects the joints that a Border Collie can get. It is called Osteochondritis Disease, and it can be hereditary, environmental, or dietary, but generally now, both parents are screened for this to ensure no affected puppies. 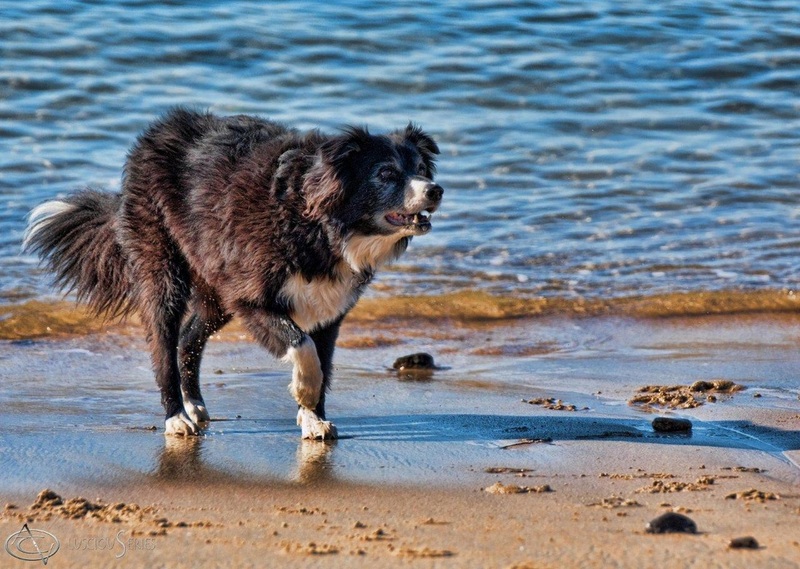 There are a number of diseases that have been found in Border Collies but these are less common. They include Elbow Dysplasia and Neuronal Ceroid Lipofuscinosis. This is very severe, but thankfully very rare and a dog with this disease rarely lives for longer than two years.